Clothing patterns are used to sew stylish garments that fit well. Individual pattern pieces are used to cut fabric pieces, which are then assembled and sewn to create a wearable garment. Today, clothing patterns are usually mass-produced of thin tissue packaged in envelopes, and are sold according to standard body sizes (size 4, 6, 8, 10, etc.) Garment illustrations and pertinent information such as purchase of closure and notions are printed on the outside of the envelopes. General instructions are included in the package, and individual pattern pieces contain specific information pertaining to seam allowance and alignment of the fabric according to the grain or warp of the material. Sewing instructions are keyed to numbered or lettered pattern pieces so they are easy to understand. Patterns are distributed through fabric stores (they are shown in catalogs there) or by mail. The actual printing of the paper pattern pieces is not time-consuming, nor expensive. Rather, the design of the pattern is the most time-consuming and costly part of production. Essentially, a designer's sketch must be translated into a standard-size pattern that must be stylish and easy to construct. A successful pattern enables a sewer to produce an article of clothing for a fraction of the cost it would take to purchase a garment ready-made in a store. For centuries, obtaining fashionable clothing that also fit properly was difficult to do. The wealthy hired tailors or professional dressmakers to sew custom-fit fashions. However, those of lesser means muddled through with old clothes, makeshift fashions that were ill-fitting, or lived with re-made hand-me-downs. The ready-to-wear industry was not in full swing and therefore did not produce affordable women's dress until about 1880 (some men's garments were available earlier in the century). However, by the early nineteenth century, some women's magazines included pattern pieces for garments such as corsets in order to assist women in obtaining fashionable dress. Since the pieces were simply illustrated on a small magazine page and just a few inches in size, they were not easy to use. By the 1850s, Sarah Josepha Hale's famous women's magazine Godey's Lady's Book offered full-size patterns, but they were one size only—the reader would have to size it according to individual measurements. About the time of the Civil War, tailor Ebenezer Butterick developed the mass-produced tissue-paper pattern sized according to a system of proportional grading. These first patterns were cut and folded by members of the Butterick family. The Buttericks established a company in New York City and began mass-producing ladies' dress patterns by 1866. It is reputed that Butterick alone sold six million clothing pattern by 1871. James McCall, another pattern entre-preneur, produced women's clothing patterns shortly thereafter as well. At last American women could obtain a well-fitting, rather stylish garment by using a mass-produced clothing pattern. Amazingly after 120 years, both McCall and Butterick remain giants in the pattern industry. Innovations in the pattern industry since the late nineteenth century include superior marketing through women's magazines, opening branch offices throughout this country as well as Europe to keep abreast of styles, improvements in instruction sheets, the development of different product style lines, and the addition of designer lines based on the pattern of a couture creation. The paper pattern, envelope, and instructions are made of paper of varying grades. The most important component, the tissue paper pattern, is made from the lightest and thinnest paper commercially available (it is not made at the pattern companies). It is called 7.5 lb (3.4 kg) basis paper, meaning that a ream of it (500 sheets) only weighs 7.5 lb (3.4 kg). The design of the mass-produced paper pattern includes many steps. Furthermore, the creation of an easy to use, fashionable, of good fit pattern is the result of collaboration of many departments and many talents. At the outset of the design process of any garment, the pattern company's product development department must evaluate three key elements: the typical customer profile (lifestyle, skills, taste, etc), the current fashion trends, and last season's sales figures. These all factor in to making a profitable pattern—the goal of the company. Pattern companies vary in the number of new pattern collections launched each year; many launch four new collections a year. The in-house designers are inspired by observing people and their physical movements, learning about their needs, and understanding trends in their customers' lifestyle. Designers attend fashion shows, read magazines, newspapers, and trade journals to keep abreast of fads and fashions. Many designs are created for a proposed collection. Preliminary sketches are discussed by marketers, dress designers, dressmakers, etc. Sales histories on previous styles and patterns are examined and compared. Some patterns may remain in a line for more than a season based on sales alone. If a design goes through the review and appears to be a viable candidate for a pattern, it is assigned to a line, which earmarks it for a particular customer profile. The final selections are assigned a style number and returned to the design department. Next, the illustrators create the first sketches of the creation. These sketches are known as croquis, which is the French word for beginning. The croquis contains all critical information for each pattern and will form the basis of the worksheet to construct the item. In order to make the actual pattern, members of all technical departments (design merchandising, product standards, pattern-making, dressmaking) hold a construction meeting to decide details of a style and determine construction. Decisions are made on the number of pattern pieces, the style number based on degree of difficulty, suitable fabrics, sizes the patterns will be graded to, and how it will be constructed. A folder is begun for each design so that crucial information is contained within and passed to appropriate departments. The folder with the notes from the construction meeting is given to the patternmaking department. 1 Culling information from the construction meetings, the patternmaker creates the first pattern. The paper pattern is drafted onto muslin (a plain fabric) and drapes up a sample garment. The drape is pinned in place and basted (hand stitched) to keep it in place. The drape is thoroughly reviewed by both the patternmaker and designer. Adjustments are made where needed. size 10. After blocking, the pieces are plotted using a laser plotter. 3 The completed size 10 pattern is sent to the dressmaking department, where it is tested using several different fabrics. Techniques of the home sewer and domestic-use sewing machine are simulated to insure that the design will work using various fabrics and that it is not too complicated to construct. 4 After passing the home-sewing test, the pattern is then graded to the various sizes using a computer program. Thus, the complicated task of grading patterns that used to be manually performed by the patternmakers is now computerized. 5 The measuring department determines fabric yardage and notions needed. Computer software helps the technicians create the optimum fabric layout to suggest so fabric can be used efficiently. Once all information for step-by-step instructions is known, they are written up for the consumer in easy-to-understand language. 6 A computer template (or plot) is used to plot out the pattern. Pattern pieces are laid out in such a way that little tissue will be wasted in the printing process. The computerized plot and the instruction sheets are physically sent to the printer. The pattern envelope, however, is sent to the pattern printer electronically. 7 The plot is unrolled on a pre-sensitized / aluminum plate that varies in size according to the size of the tissue sheet to be printed. Plates are as small as 30 in x 90 in (76.2 cm x 229 cm) or as large as 50 in x 90 in (127 cm x 229 cm). A vacuum frame adheres the plot to the aluminum plate, lights expose the plate, and the plate is etched where the lines on the plot are printed. Thus, the plate is essentially burned with the image of the pattern pieces. 8 The plate is then printed using off-set lithography. The image is inked, transferred to a felt blanket, and is then transferred from the felt blanket to paper. This saves wear on the metal plate. 9 Pattern tissues are printed in units of 1,300 sheets. These units are kept together using clamps and are transported together. Some units may be cut down into smaller tissue pieces with a sharp saw. All tissue pieces must be folded to fit into the envelopes and may be either folded by hand or by machine. Instruction sheets are also printed using off-set lithography. 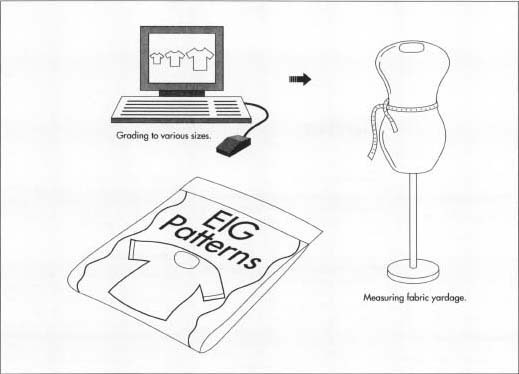 Once the pattern is tested and approved, a computerized grading program creates the various size patterns and the desired amount of fabric needed is measured. is then printed with off-set lithography. Once printed, the envelopes are folded, glued, and readied to receive the folded tissue patterns. One single clothing pattern printing facility can print 100,000 complete patterns (meaning all the tissue pieces) in a single day; it produces 23 million patterns in one year. The pattern companies rely heavily on their consumer service departments to address questions, concerns, and problems with patterns and pattern instructions. Service representatives have a thorough knowledge of sewing and of all company patterns. All customer problems, comments, or concerns are reviewed, and feedback on patterns and instructions are continually re-analyzed in order to improve the functionality of the pattern. Bryk, Nancy Emelyn Villa. American Dress Pattern Catalogs 1873-1909. NY: Dover Publications, Inc., 1988. Kidwell, Claudia Brush. Cutting a Fashionable Fit. Washington, D.C.: Smithsonian Institution Press, 1979. Gould, Donna. "The Making of a Pattern." Vogue Patterns (January/February 1996 - September/October 1996).